Twitter Result! Brexit - Will it impact your holiday choice? We’re LOVING Twitter at the moment. Not that we ever stopped loving the 140 character continuous social media timeline. But it’s no lie that Twitters daily active users have decreased over the past year, and a lot of people have been using Facebook, Instagram & Snapchat for their non-cluttered visual content, instead of the information driven timeline of Twitter. But things are really getting juicy over in the tweeter-sphere. Perhaps it’s the impact of social media in giving everyone a voice (we’re talking about politics here). But Twitter has become alight with great stories, thoughts and content – not just about Brexit, but actual meaningful topics. But what about funny videos of cats, babies and people walking into things? Don’t worry there are still funny posts to make you procrastinate from work. Just choose who you follow! We decided to do a little social experiment of ourselves. Obviously Brexit is pretty impactful on us as a family run company, and unlike the big holidays players we depend on Brits enjoying our chalets and surrounding mountains. So we started a poll and got some great feedback. What are your thoughts? Head over to our Twitter and drop us a tweet.. we’d love to hear your thoughts? 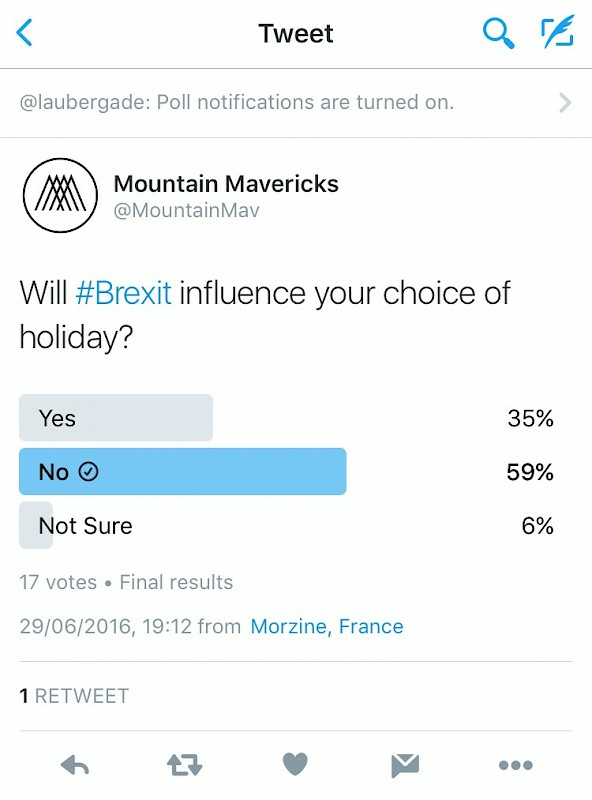 59% of you guys said that Brexit wouldn’t effect your holiday choice in the future. 6% weren’t sure – and we can only presume that you’ll wait it out for a few weeks and see how things pan out. The remaining 35% said it would impact your choice of holiday. We aren’t sure to what extent, whether you cut down the amount of holidays you take per year, whether you trim down your ski holiday just to a couple of long weekends each season or you’re looking for best value for money (Ut hum). But what we would say is don’t panic. We’ve taken advice from some of the best in the industry and with optimism things will get better. Fortunately the snow will still fall and our service in our Morzine chalets will remain at the top of it’s game without charging the high price tags other larger companies have to charge. Now – check out these other tweets about Brexit which made us laugh! Hopefully see you on Twitter (@MountainMav). Drop us a tweet or Private Message if you liked this blog and show us some love. We’ll share you some of our best procrastination videos in return! Email: thechalet@mountainmavericks.com with information on our chalet holidays. If you book in the next month you’ll recieve a 5% Brexit discount! Previous: Winter 2016/2017 in Morzine will be Mountain Mavericks most exciting yet!